This weekend I worked on a very interesting dress for a friend you've already met. She brought 2m of viscose with a lovely print, so we started looking for an interesting pattern to use. She liked the knotted dress from Burda Style 12/2012. The pattern doesn't have many pieces but the knot on the waist looks like an interesting riddle to solve. I've been wanting to try out this kind of pattern for a long time, but I've never gotten to it, so this seemed to be the great opportunity. 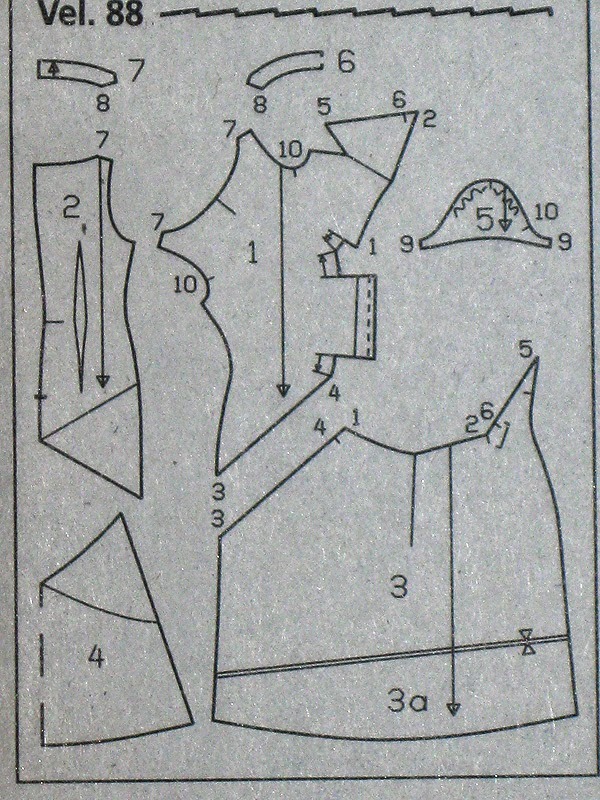 Here's how the pattern looks - when I saw the front bodice panel, I knew I would have a lot of work on the dress. 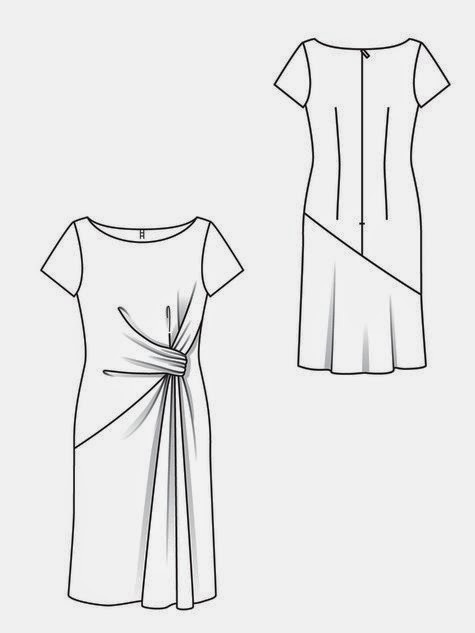 Luckily there are illustrated sewing instructions for this pattern in Burda, without them the sewing and piecing up the dress would have been a nightmare. It took me a while to analyze the instructions and brainstorm about it in order to put the dress together, but I eventually made it. What I dislike about the pattern is that it doesn't include the lining pattern. The lining could be a very simple one, and in case one used a transparent fabric having a lining under the dress would be a must. The pattern was drafted for extremely tall women, and my friend is 175 cm tall, so I wasn't sure if I would need to crop the pattern or not. And even if I had to crop it off, I wouldn't know where to start from, so I decided to make a muslin first, and I'm very glad for that. The friend is yet to try out the dress, but I've already noticed some issues with it. You see, the knot makes a huge bulk since the dress is being gathered at the same spot both vertically and horizontally. 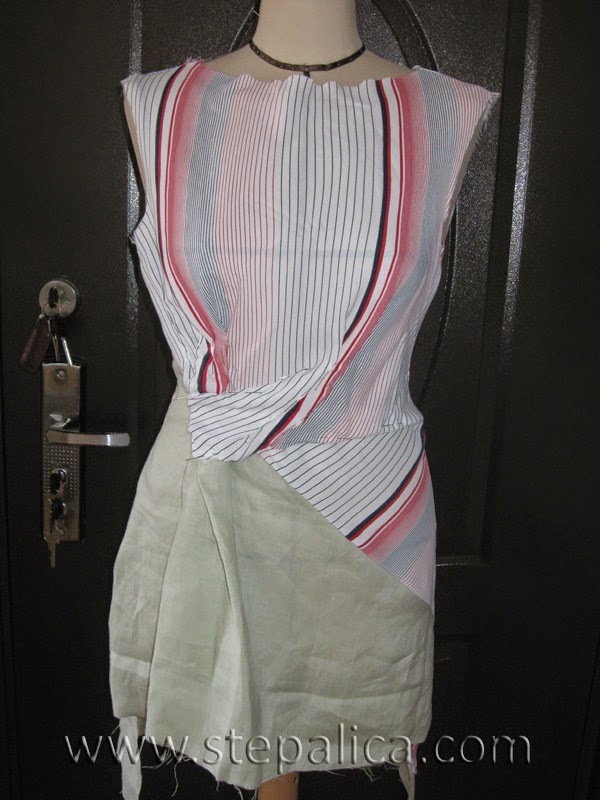 Additionally, the bulk adds some weight to the dress, and is pulling the bodice down. I used a viscose fabric as a muslin, and the fabric is of same weight as the one we'll use for the final dress. The fabric is rather soft, drapey and light, but it looks like it's too thick for this model. Besides, I'm not sure I would like to wear a dress with a bulk on a waist. I have some ideas for fixing the pattern, but I'll have to wait for the friend to try out the dress before I continue working on it. Fascinating design! I've had this weight issue in some pleated knit tops I've tried. The weight of the fabric drags the neckline down in a very unflattering way. 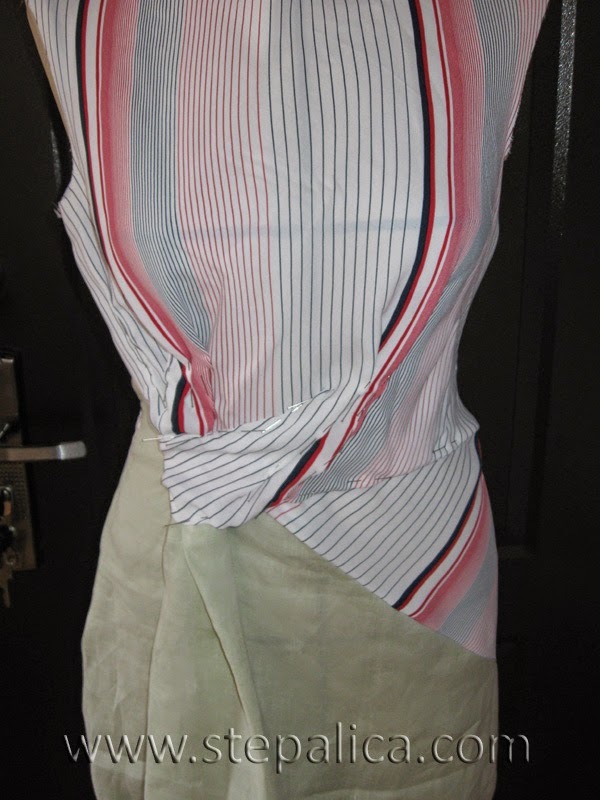 The Burda version does look crisp like a dupioni or shantung. It is fun to watch you work out these issues. I love the back of that design too. Last night we fitted the dress, and the friend didn't think the knot was too bulky. I had to crop the bodice a bit and re-arrange the gathers, but the main design features are still there. I will post about the fitting process soon.